Kitchens tend to be the go-to space for family and friends — the hangout centers where everyone can converge, converse, and mingle while sharing the prepping and cooking duties. If your home’s culinary hub needs a few refreshing touches or if you’re considering a complete or partial overhaul, the design choices in 2019 are as varied as the selections in a five-star buffet line. Whether you go bold and dramatic in a kitchen makeover or you’re a practicing minimalist, design teams have come up with ingredients that blend both aesthetics and practicality. 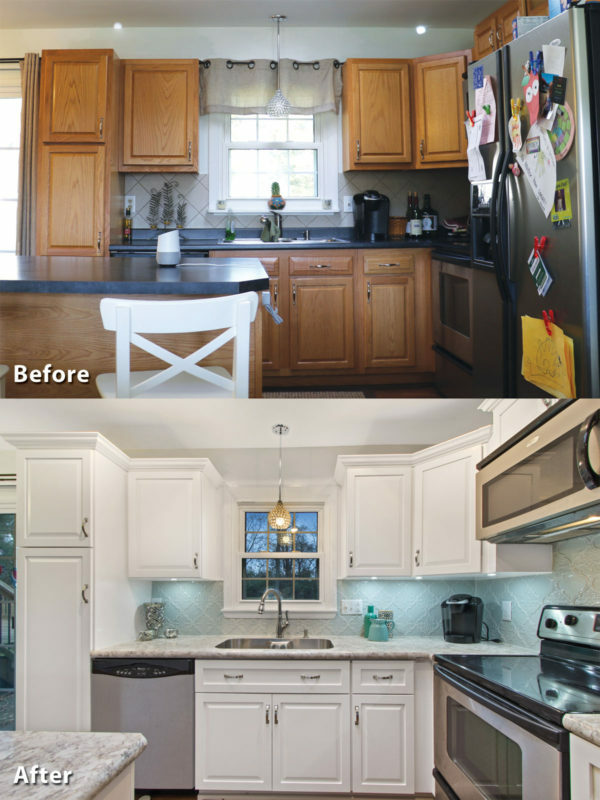 A simple cosmetic redo may be just the answer for tired-looking or outdated cabinets. Rather than replacing your entire set of cabinetry, there is another option, according to Peter Ciccocioppo, president of KS Renewal Systems LLC in Lewisberry, Pennsylvania. He suggests installing brand-new, custom-made cabinet doors and drawer fronts, which come in assorted styles and colors. 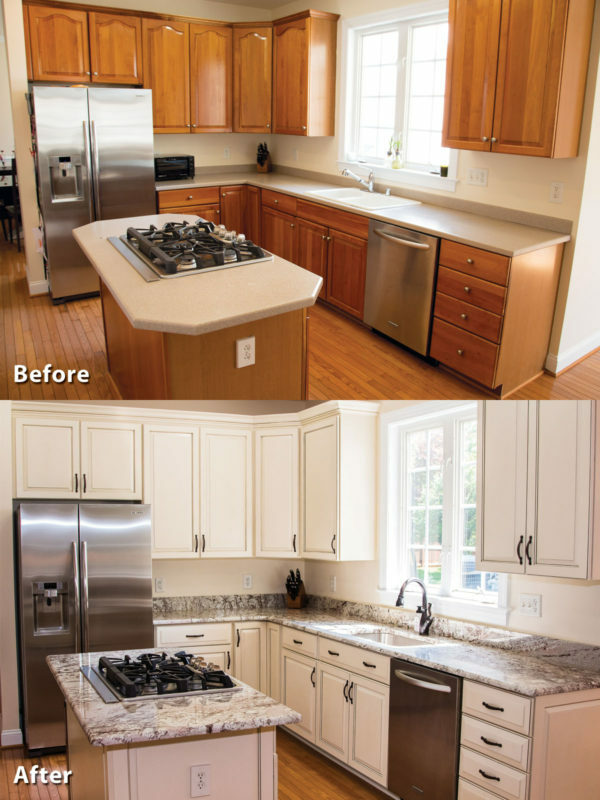 Not only can your existing kitchen cabinets be modified by refacing them rather than replacing them, but custom-built cabinets and drawers can be made to match, if needed. By leaving your structurally sound cabinet boxes in place, hardwood and laminate materials are used to update what you already have. Keeping the cabinet boxes intact keeps the cost down for those who want to renovate but don’t have the money for a full-fledged remodeling job. There are many innovative storage solutions, sink and faucet replacements, and under-cabinet lighting options, as well as countertop upgrades that can be considered when designing your kitchen update. The entire installation of the cabinet and drawer faces is accomplished “without disturbing the footprint” of the homeowner’s kitchen, Ciccocioppo says, so the countertops, floors, and walls remain unscathed. Downtime for the makeover is minimal, usually three to five days. In addition, Ciccocioppo says the refacing option cuts down on the mess. 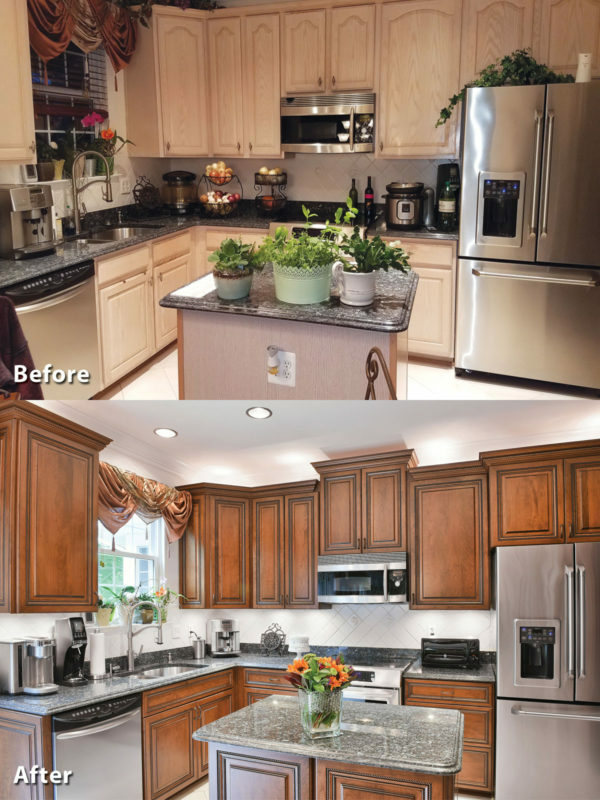 A few upgrades can help you achieve the most efficiency from your existing cabinets. Full-extension slides allow drawers to open fully and close quietly with a soft push; this simple improvement provides 3 or more inches of drawer space. The same technique can also be applied to rollout shelves, increasing their accessibility while maximizing their storage potential. As for cabinet colors, white appears to be an enduring choice. Whether it’s the fresh, clean look it exudes, the tranquility it nurtures, or its basic flexibility as a backdrop, “White and off-white are still in,” says Ciccocioppo. 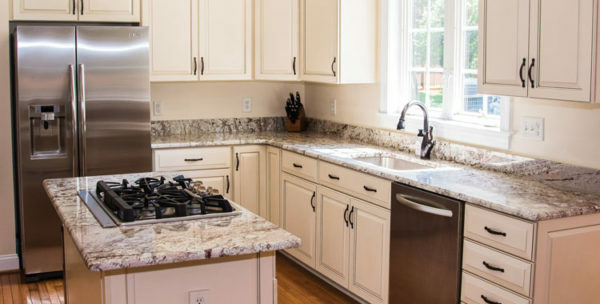 While white cabinets may be requested by many of his customers, Ciccocioppo says if you prefer gray, you can look forward to a few more years of its popularity. On the other hand, design experts claim “black is having a moment” in 2019, especially when paired with copper accents and hardware. Additional cabinet hues popping up this year include green-tinged colors, navy blue, and plum. Although he says two-toned cabinetry is less than 10 percent of what his company is asked to do, it is trending this year. Even shiplap- and beadboard-paneled cabinets are options for 2019. While not for everyone, an entirely different line of thought is to go with fewer or no upper cabinets. This option opens up wall space and can help your kitchen appear larger and less cluttered. Seamless or minimal hardware options are also finding favor, along with wood or leather drawer and door pulls for those who desire a natural, organic feel. If you’d rather hold on to your cabinetry hardware, Ciccocioppo says caramel bronze is a new color for knob pulls, although he adds satin nickel finishes remain popular. Solid-colored islands are still in demand for seating, sinks, and storage and are paired with white cabinets for contrast. Glossy finishes on cabinets and appliances are toned down with matte finishes. Concealed ventilation, again for a more seamless look, is in style, while the statement range hood is on the way out. Unique sinks, such as metallic with hammered finishes, are also favorites. Open shelving continues to trend, allowing you to showcase your kitchenware or display your collection of artwork, pottery, or vintage pieces. Stainless-steel appliances may be losing their appeal as the current trends lean toward more neutral finishes or just the opposite — bold colors and patterns — in addition to black and slate for that dash of elegance. Subway tiles enjoyed a heyday in recent years, but make way for Moroccan- and Spanish-patterned backsplash tiles. For those looking for more organic textures, backsplashes that look to be hand-hammered are also appearing on the scene. Ciccocioppo says they still install laminate backsplashes, but he says tile and glass are trending. You’ll also see larger tiles along with an assortment of textures and patterns — sculpted, beveled, or stacked. If you choose to nix your upper cabinets for a simpler, cleaner look, you’ll suddenly have room for backsplashes with attitude: Extend those tiles to the ceiling or create a narrow ledge or shelf design. Although KS Renewal Systems LLC installs less costly laminate countertops with high-definition finishes, including harder and textured surfaces, “quartz is hot for countertops right now,” Ciccocioppo says. Quartz is replacing the recent granite trend, with finishes in neutral colors such as gray, taupe, cream, or white. Quartz is also easier to maintain and is antimicrobial. Several innovative storage tricks Ciccocioppo mentioned include pull-out trash cans and can-specific recycling bins; a lazy Susan for corner cabinets; wood knife-block inserts; wood spice-drawer inserts; and tip-out trays at the sink for sponge storage. Also trending are drawer stacks in place of base cabinets, which provide convenient storage solutions for pots and pans or small appliances. Hardwood is still popular, but ceramic flooring is making a move in 2019, and ceramic tiles can replicate the look of hardwood. Designers suggest mixing it up with dark floors and lighter-colored walls and cabinets. Whether you swap out your cabinets and hardware, give the walls a fresh layer of paint and update your appliances, or take the plunge for a complete transformation, you have to live with your decisions. Do your research to decide what you need and what will make you happy, and don’t be afraid to mix and match some timeless ideas with a few current trends.